2 At that time Eli, whose eyesight had begun to grow dim so that he could not see, was lying down in his room; 3 the lamp of God had not yet gone out, and Samuel was lying down in the temple of the Lord, where the ark of God was. 4 Then the Lord called, “Samuel! Samuel!” and he said, “Here I am!” 5 and ran to Eli, and said, “Here I am, for you called me.” But he said, “I did not call; lie down again.” So he went and lay down. 6 The Lord called again, “Samuel!” Samuel got up and went to Eli, and said, “Here I am, for you called me.” But he said, “I did not call, my son; lie down again.” 7 Now Samuel did not yet know the Lord, and the word of the Lord had not yet been revealed to him. 8 The Lord called Samuel again, a third time. And he got up and went to Eli, and said, “Here I am, for you called me.” Then Eli perceived that the Lord was calling the boy. 9 Therefore Eli said to Samuel, “Go, lie down; and if he calls you, you shall say, ‘Speak, Lord, for your servant is listening.’” So Samuel went and lay down in his place. In a few weeks I will celebrate the thirty-third anniversary of my ordination to ministry in the Christian Church (Disciples of Christ). I have an ordination certificate to remind me of the time and place at which the event occurred. I do remember that day, which followed a day after I received my M.Div. degree at Fuller Seminary. What I can’t remember is the exact moment or time at which I sensed a call to ministry. I can’t say that I had an extraordinary experience of God speaking directly to me, issuing a call to ministry. But, at some point along my life path I found myself moving toward that Sunday afternoon in June of 1985, when a gathering of elders from Temple City Christian Church and other clergy, both Disciples and non-Disciples, laid their hands on me and offered a prayer of consecration, setting me apart for ministry in the church. I will admit that at the time, I didn’t expect to spend my future years as an actual pastor. I assumed I would be a professor of some type. I would go on from there to pursue further education to support that dream. Here I am, some thirty-three years later, having spent the past twenty years serving as pastor of three different congregations. When did the call really come? 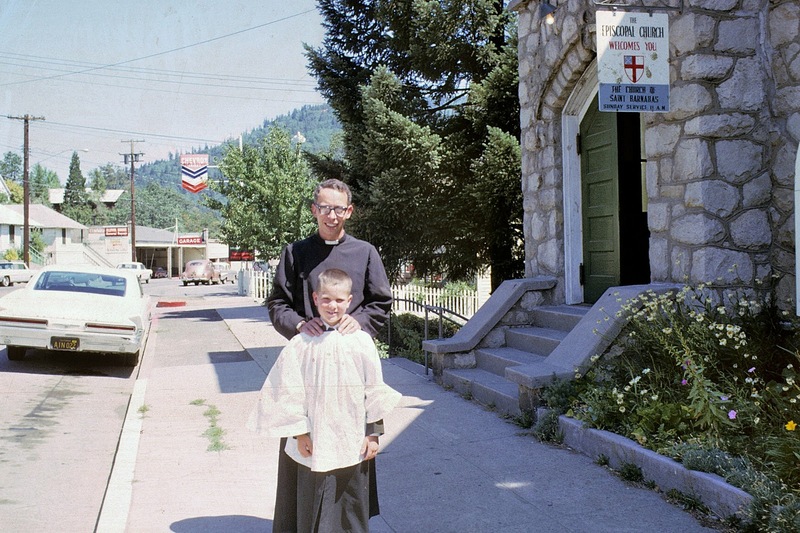 Could seeds have been planted back when I was a child, serving as an acolyte at St. Barnabas Episcopal Church in Dunsmuir, California (now in Mount Shasta)? Was it when I was asked to become a lay-reader as a teenager, because Fr. Green felt that I had the voice to lead portions of the liturgy? Whenever the call came, I find myself in this position of service in the church. My story is probably like many others, including the possibility that seeds were planted in childhood. The prophetic call stories in the Hebrew Bible are intriguing. They are all somewhat different. In many of them, the one being called is reticent to say yes. As we saw in the reading from Isaiah 6 for Trinity Sunday, Isaiah confessed that he was “a man of unclean lips,” and therefore unworthy of being able to face God, let alone hear a call from God. In the end, however, his lips were purified when a seraph touched his lips with a live coal taken from the altar in the Temple. After this act of purification, Isaiah answered “here am I, send me.” Jeremiah responded to God’s call, including God’s declaration that God had formed him in the womb for this purpose, by telling God that he was a mere a child and didn’t know how to speak. God responded to Jeremiah’s resistance by touching his mouth and putting words in Jeremiah’s mouth so that God’s word might be proclaimed (Jer.1:4-10). This leads us to the story of the call of the prophet/judge Samuel. Samuel is living with the aged priest Eli. He’s helping to serve in the Temple at Shiloh. It was there that the Ark of the Covenant was being kept. It is in this context that Samuel receives his call from God. The background story to Samuel’s call to prophetic ministry parallels that of John the Baptist. Both prophets were born to older mothers who were considered barren, and therefore felt the shame of the community, but then by divine intervention their mothers conceived and bore sons who would grow up to be prophets. It is worth noting that in the ancient world, as well as some parts of our contemporary world, to not bear a child was considered a sign of divine judgment. Thus, the prayer of Hannah was for a child to be born, not so she could fulfill some maternal dream, but so her shame might be removed. This might not be our cultural dynamic, but it was true in the days of yore. So, when the desired child was old enough, Hannah brought her child to the Temple in fulfillment of a promise made to God. Again, this might not be our way of thinking, but it was the way things were. That is how Samuel came to live with an elderly priest whose sons were less than honorable. It is the reason why Samuel is in this position to hear the call of God while sleeping in the Temple. The call of Samuel is set up by the declaration that “the word of the Lord was rare in those days.” What might this mean? Could it be that the people were not in a frame of mind to hear that word? Could the reference to Eli’s eyesight—perhaps blindness—have a spiritual reference point? Could this be due to spiritual complacency? Could it be that there is no word, because no one is ready to hear it? That leads to the question: Is Samuel different? Is he, as the miracle child, the one person who is in a position to hear God’s voice? As we ponder these questions we find Samuel asleep in the temple at Shiloh. As he sleeps, he hears a voice calling his name. Considering his job description, he is likely sleeping near the Ark of the Covenant. For those of us who have been influenced by Raiders of the Lost Ark, it’s probably easier to envision a voice speaking from the Ark. But, this isn’t Raiders of the Lost Ark, this is the Bible. When Samuel hears this voice, he goes to Eli and asks the priest what he wanted, at which time he’s sent back to bed. Just a child’s vivid imagination! After all, the word of God was rare in those days. This will happen two more times before Eli decides that something is up. Eli may not be the most faithful priest, but he knew that God could speak. So, after the third time, Eli tells Samuel to answer the voice with the words: “Speak, for your servant is listening.” As one reads further along in the story, we discover that Samuel has heard God’s voice and Samuel will speak for God to the people. He will even anoint kings. That Samuel could respond to this calling, serves as a reminder that God is not without witnesses, even when things look difficult. After all, the “lamp of God had not yet gone out.” There was hope that the flame of God would be carried on to the next generation through the call of Samuel. So, what might this say to us? Could it be that we should help young people, including small children listen for God’s voice? If so, how might we do this? For me, it might have been serving as an acolyte and then as a lay reader. For who knows when a call will come? Bob Cornwall is a Disciples of Christ pastor, church historian, and author. He currently serves as Pastor of Central Woodward Christian Church (Disciples of Christ) of Troy, Michigan. He holds a Ph.D. in Historical Theology from Fuller Theological Seminary, along with an M.Div. from Fuller and a B.S. degree from Northwest Christian University in Eugene, OR. Bob has authored several books, as well as numerous articles and book reviews. He currently edits Sharing the Practice (Academy of Parish Clergy) and among the books already published, he has a number of books that have appeared with Energion Publications — Marriage in Interesting Times: A Participatory Study Guide, Unfettered Spirit: Spiritual Gifts for a New Great Awakening, Worshiping with Charles Darwin, Ultimate Allegiance: The Subversive Nature of the Lord’s Prayer and Ephesians: A Participatory Study Guide, and Faith in the Public Square (2012). He’s also the author of Freedom in Covenant (Wipf and Stock, 2015). For more on my books, see my Amazon Author Page: amazon.com/author/robertcornwall.